Unfortunately, when an air compressor starts and stops too frequently, there could be a number of issues at fault. On this page we’ll examine the common causes to figure out why, when your air compressor starts and stops too often, you can zero in on the cause and correct it. The air compressor is supposed to start and stop periodically, of course. That process is controlled by the compressor pressure switch. 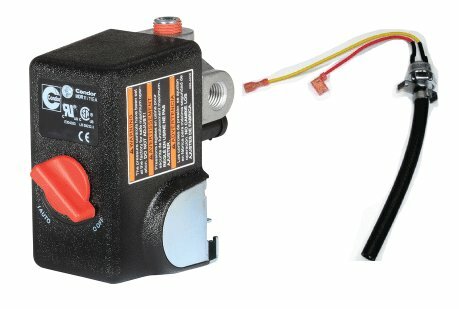 If you are not sure what that is, scroll down the sitemap page to find pages of information about what the compressor pressure switch is and does. Briefly, the compressor pressure switch trips to off when the tank pressure reaches a certain pressure level, known as the cut out pressure, and the compressor should stop. When compressed air is used and when the tank pressure reaches a certain lower pressure called the cut in pressure setting, the pressure switch trips to on, and the air compressor should start. The range of pressure between the air compressor stopping and then starting is in the 20 – 30 PSI area. If your compressor stops at 120 PSI for example, it would typically start around the 90 PSI tank pressure level. Pair of typical pressure switches for different types of compressors. There are many other styles of pressure switches. If your air compressor starts and stops, knowing if the compressor power supply is good is the first step. Monitor the supply or line side of the pressure switch with the voltage monitor, to ensure that power supply to the switch is always there when the compressor is plugged in and the ON/OFF switch (if there is one) is on. A fluctuating power supply can cause the compressor to start and stop. Is the pressure switch working? Next, is the pressure switch actually working? If the tank pressure is below the normal cut in pressure for your model of compressor, power should be crossing from the line side to the load/motor side of the switch. If the tank pressure is at the normal cut out pressure or above it, power should not be passing the pressure switch. With the tank empty of air and the power on, the compressor should be running. If it is not, use a multimeter or another type of voltage detector to determine if power has reached the motor side of the switch. If not, then it is likely that the pressure switch has failed..
A failing pressure switch can also result in power fluctuating across the terminals inside, and this could cause compressor starts and stops cycles. If the tank pressure is between cut in and cut out, and the compressor has stopped, check to be sure power is still on the motor side of the switch. If not, once again, the pressure switch is suspect. Power is going to motor but still the compressor starts and stops! It is possible that the compressor motor is overheating. Most compressor motors will have a thermal cut out. This device will cut power before heat related damage can occur to the motor. Once the motor has cooled, if the power is on and the tank pressure is below cut in, the compressor will start again. Ensure that the amperage of the breaker / fuse in the circuit that supplies the socket into which your compressor is plugged is rated for the HP of the motor. Google amperge for electric motors to find some guidelines. If you are using an extension cord or power bar to get electrical power to your compressor…. DON’T! Plug the compressor diretly into a socket that is supplied by a breaker or fuse that has sufficient amperage for the compressor motor HP. It’s always a far better option to use a longer air hose to get compressed air to the point of use, than to use a too small extension cord to move the compressor closer to the work. Pay attention to the duty cycle of the air compressor. Even smaller air compressors that claim a 100% duty cycle – and you might infer from that that you can run them continuously – are generally not supposed to run that long. If you are using your compressor for extended periods, and the compressor starts and stops on it’s own, try running if for 10-15 minutes and then letting it cool for that same amount of time. If you need an air compressor to run for continuous periods on a frequent basis, it may be that the tool demand exceeds the capacity of the compressor, it runs too long, and goes off on thermal cut out. This being the case, you need an air compressor with greater air delivery capacity. There is another compressor component that could cause the compressor to start and stop, and that is that the start or run capacitor is failing. 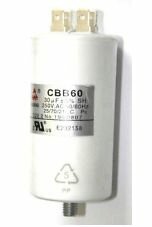 These capacitors are normally located on the exterior of the compressor motor. Your compressor motor may have one or two capacitors, depending on whether that motor has a start, a run, or a combination capacitor. What the capacitors do is give the motor an electrical boost when it’s starting, and ongoing power support when it’s running, if that compressor motor has a run capacitor as well. If you’ve worked through the reasons for the compressor starting and stopping with no relief as yet, it’s time to check the capacitors. There is a page on this site that explains how to do that, and provides further information about compressor motor capacitors if you are interested. We have discussed the most frequent reasons for a compressor that starts and stops with abnormal frequency when you are using it. There can be other reason, yet typically they will be to do with the power supply, or the motor itself. If you have worked through the advice above and your air compressor still has a starting and stopping issue, why not post a question in the ASK forum page? Please identify the make and model of compressor you are asking for help with, and let us know what you found when you followed the steps above to try and determine why your air compressor starts and stops.